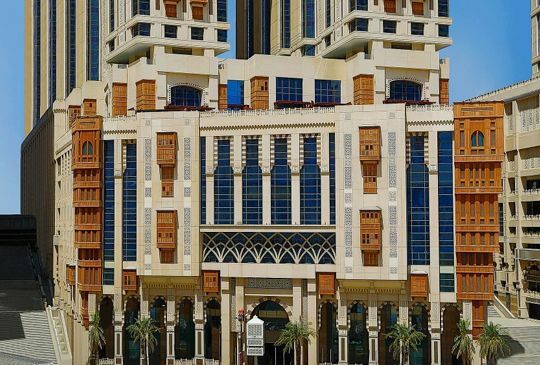 This refined luxury hotel is a 7-minute drive from Masjid al-Ḥarām, Islam’s most important mosque, which houses the Kaaba. Polished rooms provide minibars, free Wi-Fi and flat-screen TVs, plus tea and coffeemaking facilities. Some add sofas, floor-to-ceiling windows, and/or views of the mosque or the Kaaba. Suites add butlers and access to a private lounge; some have living rooms and/or kitchens. Room service is available 24/7. Kids age 11 and under (2 per room) stay at no charge with an adult. Valet parking is free. Amenities include a buffet eatery, 2 cafes, and a steak restaurant offering views of the mosque. There’s also a 24-hour gym. This down-to-earth hotel is 2 km from Al-Masjid an-Nabawi mosque and 10 km from the Dar Al Madinah Museum.The laid-back rooms feature sitting areas, free Wi-Fi and flat-screen TVs, plus minibars and safes; some rooms sleep up to 4 people. Room service is available. Kids age 11 and under (1 per room) stay for no extra charge with an adult.The hotel offers complimentary parking. Other amenities include a classic international restaurant, an airy cafe offering light fare, and an elegant regional eatery, plus a guest lounge and a business center.